Are you Board with the Same Old Brew? Walking in the door of Fairhope Roasting Company, I was greeted by Roast Master Hanson Eskridge and Mackenzie Chandler, his marketing expert and logo designer. I wandered around, pumped a cup of coffee into a logo-ed mug, and got caught up with the personal and creative lives of my Southern Bloggers Jubilee friends. 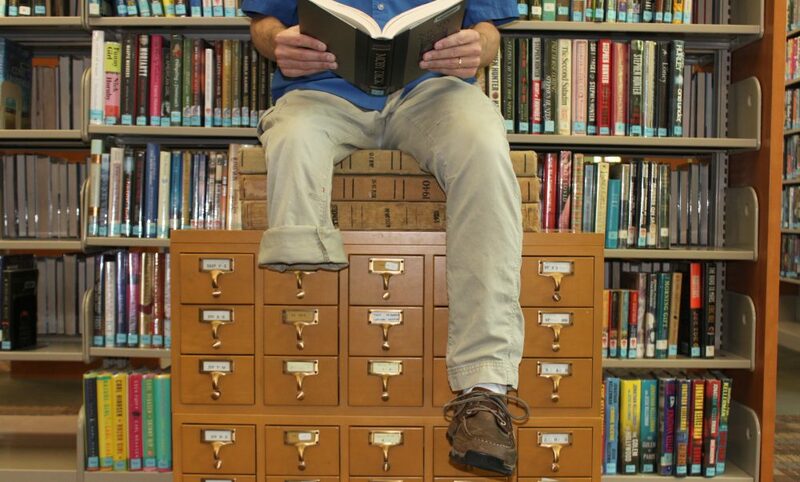 A graduate of Fairhope High, Hanson went off to “experience” college, and then headed north to pursue his passion to roast coffee. A talkative, animated, and single guy, Hanson worked at Bull Run Roasting in Minneapolis, Minnesota. Last summer he was back in Fairhope pitching his investment idea of a roaster, the first on the Eastern Shore, to Will Carlton. It turned into a “good combination” with Hanson as owner/roaster, Carlton the local investor, and Mackenzie, Will’s daughter, handling all the marketing. Three roasts were available, and I sampled them all. Morning (light), Medium (Fairhope), and dark roast were all delicious, and I found myself going back for the Fairhope, as it seemed to have the viscosity of a stout, a beer style I’ve been enjoying lately. Hanson led us to the roaster, which is located in the more industrial wing of the operation. We heard the Probat 1989 roaster whir to life. If Hanson had a nickname for his roaster, he didn’t mention it, so I’ll refer to her as Brassy, as that’s the way she looks, and may be what she’s made of. 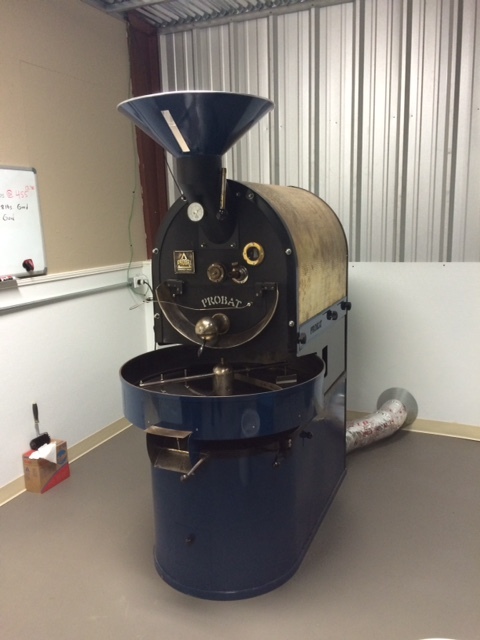 “Timing and temperature,” Hanson said are critical in the roasting process. As the gas-fired roaster reaches the correct temperature, it’s filled with Honduran beans. During the roasting, he pulled samples at intervals to show us the darkening of the bean. During the early part of the roast, the aroma filling the air was not the familiar scent of coffee. It seemed a bit more dank, a little peanut like, actually. Then we heard Brassy. Not a “pop” but a tiny blast. Hanson called it, “First Crack,” and it sounded like damp wood burning in the fireplace. After he spilled the beans from Brassy, the more familiar smell of coffee vapors filled the air. After cooling in Brassy’s spinner, he transferred the beans in a high-tech Rubbermaid bucket to the grinding and packaging area. 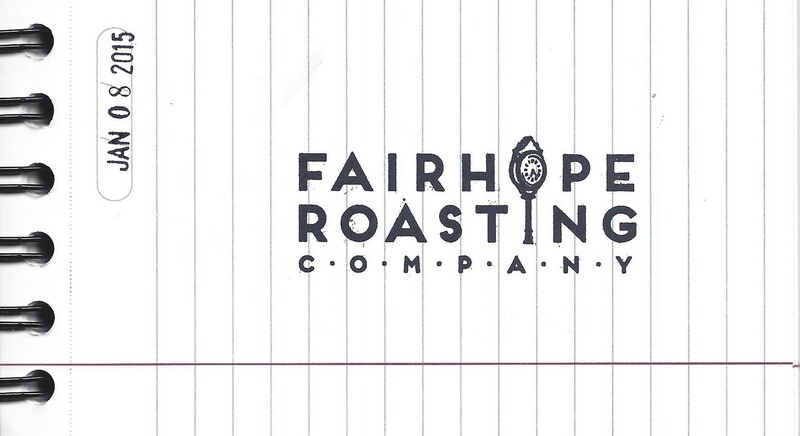 Fairhope Roasting plans on doing cupping sessions soon, according to Hanson, and they already have plans to purchase a sample roaster specifically for these sessions. Cupping sessions are like wine tastings. Hanson will take people through each roast taste by taste, and encourage feedback and discussion. Until then, he plans to post dates and times on social media when he’s roasting so current and future customers can see how the green bean is transformed. I was surprised to learn that, like a peanut has a red shell, a coffee bean (it’s really a seed) has a chaff. During the roasting of 20 pounds, Hanson said he loses about 15% of the weight in chaff and water. We each got a bag of Fairhope Roasting to go, which was very generous. Fairhope Roasting Company coffee is delicious, fresh, and available locally or you stop by their location at 361A Commercial Park Drive. If you want to learn more and sip some local roasts, Hanson will be at Mobile Green Drinks at Fairhope Brewing tomorrow from 5-7. The two companies have fused their brews and a Coffee Painted Black India Pale Ale will be available. 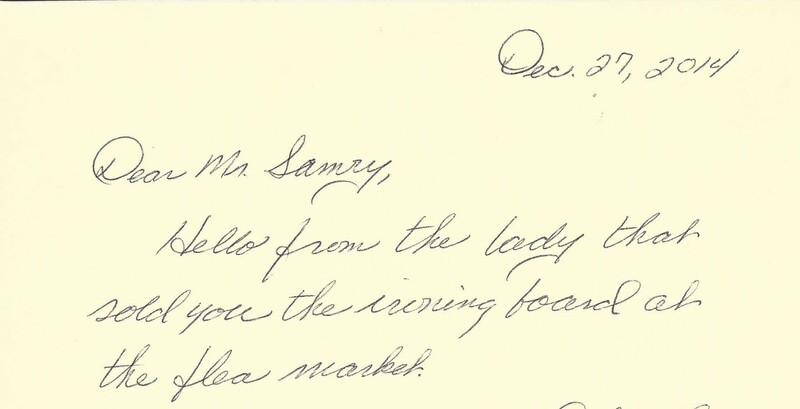 In my mailbox at the library later that day was a manila envelope. At first, I thought it was something from a coworker. Then I noticed it was addressed to me. I still love sending and receiving handwritten mail. The couple at the flea market saw me eyeing it. “It still works,” the woman said, adding that it originally belonged to her mother. Her husband showed me how it collapsed and even included a wedge to make sure the contraption didn’t spring open in transport. Patricia said she had no room for the ironing board now that she and her husband were full-time RVers. “Thanks for the story behind the board,” I told her before slipping it under my arm and carrying it away like a surfboard. I didn’t think much about the scraps of paper that lingered on the bottom. Until she mailed the label to me! 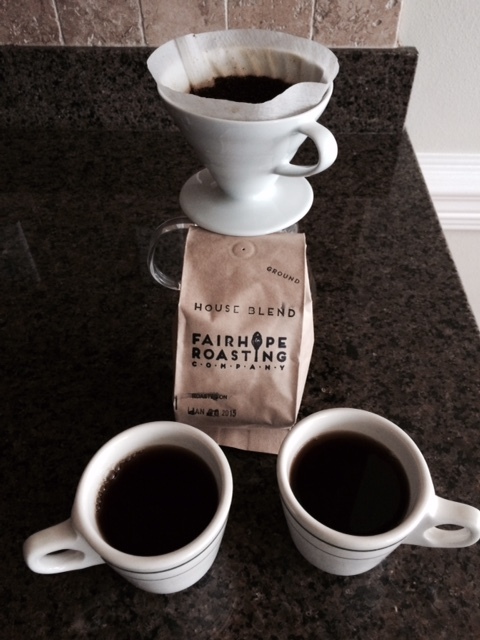 On Saturday morning I brewed Fairhope Roasting’s coffee through my new Hario V60 slow pour coffee kit. When I visited Stumptown Coffee in Portland, my appreciation for the taste of coffee, not the cream, truly evolved. Since then I’ve become a big fan of slow coffee. The slow coffee movement is where you, the drinker, control the ingredients, time, and temperature of the brewing. I didn’t roast the coffee. I didn’t make the iron or the board, but there is something satisfying in participating in these rituals with new tools and techniques that harken back to old ways. I brewed a quality, fresh cup of coffee from beans roasted locally. 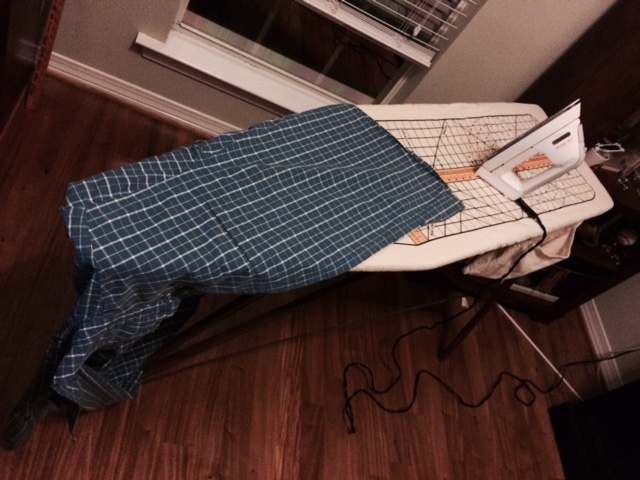 My shirts are ironed on a board made in the 1930s. Whether you use new, bright, and shiny, or antique, dull, and rusty, the way we get things done affects us emotionally and opens us to change. As I pour the coffee, press the wrinkles, or push the ink onto the page, I think about the people who made the coldest day of the year quite personal, comfortable, and warm.